$Signed a four-year, $7.38 million contract with the Browns in June of 2018. Kitchens was responding to inquiries about the recent signing of Kareem Hunt, who is expected to serve a lengthy suspension before he can suit up for his new team in a regular-season game. 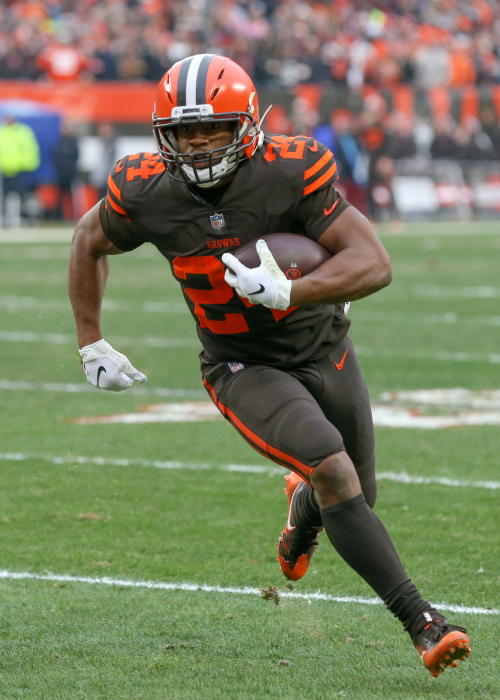 It was an unexpected move from a franchise that already has Chubb and Duke Johnson in the backfield, especially after the former produced 5.2 yards per carry and 10 total touchdowns in 2018. Despite the brilliant rookie-year performance, the addition of Hunt creates some worries about Chubb's workload for the second half of the 2019 campaign. How do Nick Chubb's 2018 advanced stats compare to other running backs? See where Nick Chubb lined up on the field and how he performed at each spot. How do Nick Chubb's measurables compare to other running backs?